Composite image of completed 3D prints, photographed before being shipped. Ben Franklin rises again. Only, this time instead of being an undead character in a series of children’s books, Ben Franklinstein is the loving nick-name given to a project that crowdsources the 3D-printed reproduction of Jean-Antoine Houdon’s portrait bust of the inventor and founding father. For Todd Blatt, organizer of the project, this is his second crowdsourced 3D-printing project of the year. In late January, various maker and 3D printing blogs were aflutter about a crowdsourced 3D printing project of a bust of George Washington. The group behind the project was We The Builders, consisting of six people (Todd Blatt, David Fine, Matthew Griffin, Amy Hurst, Ryan Kittleson, and Marty McGuire) who banded together during the Art Bytes hackathon at the Walters Art Museum in Baltimore, MD. After scanning Giuseppe Ceracchi’s portrait bust of Washington, they sliced the model into 110 sections and posted them on line. People registered to participate in the project, downloaded a section, and got to work printing their model. “Shortly after we started, I got a request from 3D Print Show in NY that said, ‘if you finish well put it at the front of the show,'” Recalled Todd Blatt, who spearheaded the group. That lit a fire under the project, and the team had a rush to see the prints get completed and shipped. Blatt began asking friends, participants, and his social network to invite other friends. Files were tracked. People who had registered and downloaded a part were messaged through the website to learn if they would complete their print in time, the farthest coming from China. The next project began to take shape in July. Side-stepping anything presidential, the focus of the second crowdsourced project still supported a tongue-and-cheek reference to the founding of the country once Blatt discovered Houdon’s portrait bust of Ben Franklin. “Franklin was an inventor and a tinkerer,” noted Blatt, and the project, in a way, became a nod to one of our nation’s first hackers. Blatt further observed that Franklin didn’t file for any patents, citing a quote from Franklin’s autobiography regarding his belief that people should share their inventions freely and generously. In other words, Franklin was into an opensource community more than 200 years before it was fashionable. To get the project off the ground, Blatt turned to someone he knew that already had scan data of Ben Franklin: Michael Raphael, founder of Direct Dimensions, a 3D scanning company in Owings Mills, MD. “I’ve known Michael Raphael for five years or so. He’s a friend and he has the best scanning stuff around… He did a scan of a [Houdon] replica, and he had it in the office already. So, I asked him and he sent it.” The scan data captured at Direct Dimensions involved an arm scanner, which uses a laser and captures more details. “When you scan something you get raster info. You don’t get a smooth surface: you get points,” explains Blatt. “If you do that with a lower quality scanner you’ll see the triangles.” Since arm scanners are of higher quality than a hand scanner, and not as portable, the scan of the replica was done in the lab. 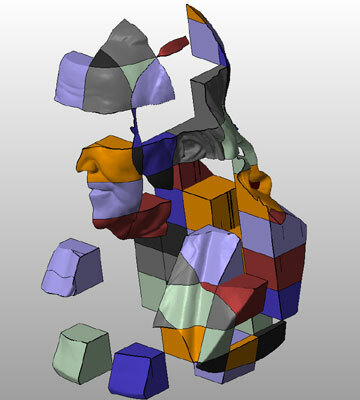 With the amount of data captured, Blatt was able to scale the model up to nearly three-times its size: comparable in scale to the Washington bust created earlier in the year. After prints were completed, individuals shipped the pieces to Blatt with a little reimbursement from Tinkerine Studios, a 3D Printer company that Blatt works for as VP of Market Direction. As pieces arrived by mid September, he took notice of the differences in materials. PLA and ABS parts were expected. 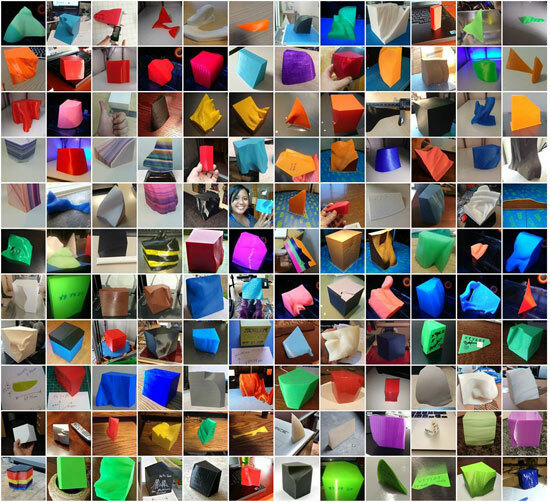 However, some makers changed out filament colors, or used markers to color the plastic, creating a rainbow of colors in one built part. “George had a wood filament part, and we metal plated a part. This time for Ben I received a resin part, a piece made with bronze powder and PLA: 80% bronze by weight and someone did an acetone treatment on an ABS print, which smoothed the stepping in the z-axis. There’s also a part made of pla mixed with pha.” The nature of how this print was constructed might give cause to conserve the outcome, although the variety of materials in the prints might make for a conservation issue. Blatt is less concerned, especially if the objects have limited exposure to sun and heat. “I do think this stuff will be around for a long time. PLA they say is biodegradeable, but it isn’t going to just melt away.” And, as the nature of the project would suggest, if there was a problem with a part in the future, it can simply be reprinted and replace. photographed at the Silver Spring Maker Faire. Check out this time-lapse video of Blatt and Marty McGuire assembling Ben Franklinstein. This program is made possible in part by funds from the New Jersey State Council on the Arts/Department of State, a Partner Agency of the National Endowment for the Arts and by funds from the National Endowment for the Arts.